The city of Denver is known for many things. It’s home to the country’s craft beer revolution, holds some of the finest skiing slops in the world, is America’s tech startup capital and the new luxury Denver apartments. Aside from all of these exquisite features, locals also know it’s home to one of the city’s best kept secrets: Pirate’s Cove. This five-star waterpark is where Denverite families go to cool off in the summer heat and have a blast doing it. With summer in full swing in the Mile High City, there’s no better place to be. Here’s what you can expect from this hidden gem. Before diving into the park’s features, here’s what you’ll need to know in order to plan your visit. Pirate’s Cove is located right on Belleview Avenue in the neighborhood of Englewood. You can find it between South Santa Fe Drive and Broadway. Getting there is as simple as taking US 85 to I-25, 5h3n travelling along C-470 until you hit Belleview. Family passes are available for $268, with residents receiving a discounted price of $176. Individual season passes are also available starting at $104 and reaching as low as $64 for children and seniors living in Englewood. You can pick up your pass from the Englewood Recreation Center, which also entitles you to special discounts on parties, or buy your tickets online via this link. Pirate’s Cove has six main attraction to help you cool off in the summer heat. 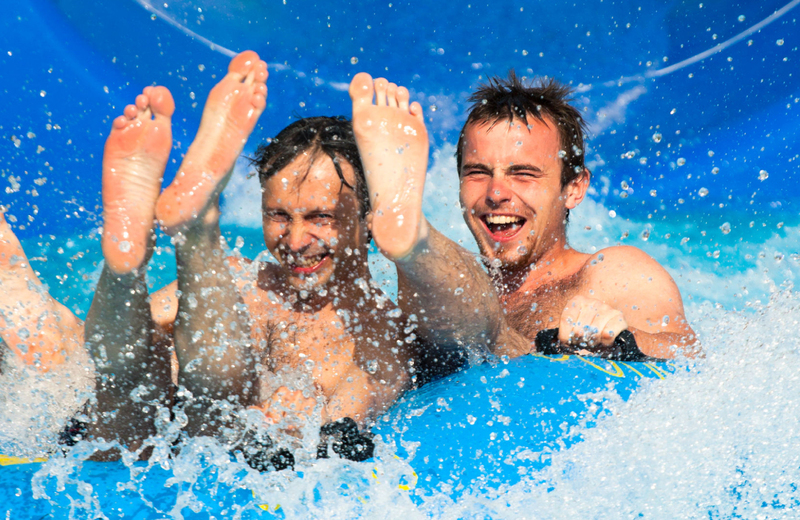 From slides to lazy rivers, there’s a little something for everyone. The river is, as you might have guessed from the name, a lazy river. Long, slow, moving, and ultimately relaxing, visitors can lounge about in their inner tubes as they move around the upper levels of the park. You can catch an up-close look at other visitors shooting out of the water slides before hopping off, or head into the Swirling Vortex for a wild ride. If you’re looking for a more traditional water park experience, then head over The Bay. This competitive-sized pool offers waters deep enough to submerge yourself in, a diving board for tricks and enormous splashes, and a drop slide (which starts out vertical) for added fun. This is Pirate Cove’s sandy shore. Here, park visitors can build marvelous sand castles or just enjoy the feeling of sand between their toes. It’s an excellent play area for children, and nice reprieve from the water. Little ones and adults alike can cool off in the Spray Garden. This installation features a variety of water-spraying sculptures and squirting fountains, providing a fun way to for children to interact with their surroundings. Towering 35 feet above the ground, visitors can climb the stairs to find entrances to a variety of water slides. Head down the loops, twists, and bends as you fly towards the pool below. There are three slides in total. One is built for speed, one is a twisting closed tube, and the third sends you flying up and down it’s open sides. Looking for a little more secluded experience? Try renting a Cove Cabana. These 10 by 10 shelters are three sided, featuring two lounge chairs, four regular chairs and a dining table. Up to eight people can rent a cabana for the cost of $80, with the price going up to $95 on weekends. Also, cabana number five features an electrical outlet. These additions create a wonderfully private experience where you can lounge the day away, stepping out of the sun when need be. It’s also great for families who want to have lunch out of the sun or need a place for toddlers to take a quick nap. From time to time, Pirate’s Cove runs specials on discounted tickets. Check their website every now and again for these money-saving opportunities. A penny saved is a penny earned, after all. The park also hosts birthday parties, offering the Captain Cook and Billy Bones packages. Captain Cook includes fifteen tickets, reserved tables for an hour and a half block, and goodie bags for your guests. For $294, the package also includes cake, ice cream, and soda. The Billy Bones package ups the ticket count to twenty-four for $374, but includes all of the same features as the Captain Cook package. Parents can add on pizza, additional guests, and Big Squirt drinks for an extra fee. Residents of The Palmer receive discounted tickets to Pirate’s Cove thanks to their premier location in Englewood. Conveniently located near The Inverness Business Park and The Denver Tech Center, these luxurious homes act as the middle ground between work and play. Englewood is a vibrant, walkable community with access to areas finest amenities just outside your door. Residents have access to an abundance of recreational, cultural, and retail opportunities. Each home in these eleven three and four-story garden style buildings is furnished with the best in modern furnishings. A wealth of on-site amenities cater to every facet of life from staying fit to doing business and entertaining guests. We invite you to experience a new way to live in the city of Denver. Welcome to a refined sense of luxury. Welcome to The Palmer.